A strong upper ridge is centered over N Europe with a very deep trough over the N Atlantic, ejecting a short-wave towards the British Isles and Ireland. An upper low over the S Mediterranean is finally weakening while drifting east. At surface, a deep cyclone moves north along the W Irish coast. ENH risk has been issued for W-CNTRL Ireland and areas towards west with threat for severe winds in excess of 100-110 km/h. 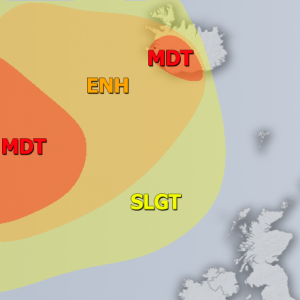 SLGT risk has been issued for areas surrounding the ENH risk including the rest of Ireland and the Northern Ireland with threat for severe winds in excess of 90 km/h. SLGT risk hs been issued for NE Portugal and N Spain with threat for severe storms, capable of producing marginally large hail, severe winds and torrential rainfall along the cold front moving through from the west. MRGL risks have been issued for Crete island into SW Turkey and for the eastern Turkey with isolated threat for severe storms, capable of producing severe winds, torrential rainfall and marginal hail.